It’s very unusual these days for ski resorts to open up whole new mountainsides for skiing. Environmental objections usually win the day. But after years of negotiating and compromising on plans, the French resort of La Rosière (which I visited last month) has got the go ahead for an exciting new expansion costing €15 million. Mont Valaisan, at the eastern end of its ski area, will be accessible by ski lifts for the first time next season. Two successive new six-packs will whisk you from 1935m to a new highpoint for the ski area of 2800m in around eight minutes. The lifts will serve five new red pistes and a big area of off-piste. There’s no need for snowmaking says the lift company because ‘the resort gets a huge amount of natural snow and the new area does not get affected by wind, which all gets funneled over the pass to Italy.’ They are confident enough to claim ‘guaranteed snow cover from December to late April’ for the new area. 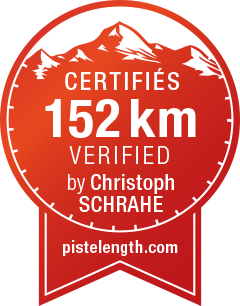 At the same time, the Espace San Bernardo ski area that La Rosière shares with La Thuile in Italy has become one of the new areas to have its claimed km of pistes certified by Christoph Schrahe for the 2018/19 season. At 152km it ranks as the 34th largest ski area in the world. Avid readers of Where to Ski and Snowboard will remember that we have been complaining about resorts exaggerating the extent of their pistes since the first edition of WTSS 25 years ago. In 2013, we were proved right by German ski resort expert Christoph Schrahe. He measured the actual lengths of pistes in all the major resorts and found the vast majority exaggerated the extent of their terrain. Since then Schrahe has been busy trying to persuade resorts to sign up to his measuring method and have their claims verified and certified by his company. According to his website, as of March 2018, a total of 38 ski areas in Austria, Germany, Switzerland, France, Italy, Greece and the USA had been certified. We urge more to do so. Only if all resorts measure their pistes in a consistent way, such as Schrahe’s, will skiers be able to accurately compare the relative size of all ski areas.